France and Germany To Develop New Fighter Without UK? A Franco-German agreement last month to “jointly develop a future combat aircraft system” raises questions about the future of a similar Anglo-French agreement to develop a Future Combat Air System (FCAS) that was concluded in principle in March of last year. The Franco-German pact resulted from the annual meeting of the two nations’ Ministerial Council in Paris on July 13. French president Emmanuel Macron described it as “a revolution.” A joint statement declared that the two countries would develop a “roadmap” for the project by mid-2018. The £1.8 billion ($2.4 billion) contract for two Anglo-French FCAS operational demonstrators has not yet been issued by the two governments. Both BAE Systems and Dassault Aviation have said recently that they hope to receive it by year-end. The two companies previously received funding from the two governments for a joint feasibility study, then some pre-development work. Meanwhile they continued to work separately on the Taranis and Neuron unmanned combat air vehicle (UCAV) demonstrators respectively. Taranis is an all-British effort for which BAE Systems is the lead contractor; Dassault enjoys the same status on the six-nation pan-European Neuron project. Both these UCAVs have completed flying demonstration programs, although France recently decided to extend flight tests of the Neuron for a second time. Despite the potential of the agreement in Paris to disrupt further Anglo-French cooperation, BAE Systems managing director for military air systems Chris Boardman welcomed it during a meeting with defense journalists at the Royal International Air Tattoo (RIAT) last month. “The world is thinking about a next-generation fighter,” he said. “One way or another, the UK will have an involvement—I think,” he continued with less certainty. The Paris agreement did not specify a manned or unmanned aircraft, or a mix. But the mix is apparently favored in Germany, where a “Next Generation Weapon System” (NGWS) concept is evolving. 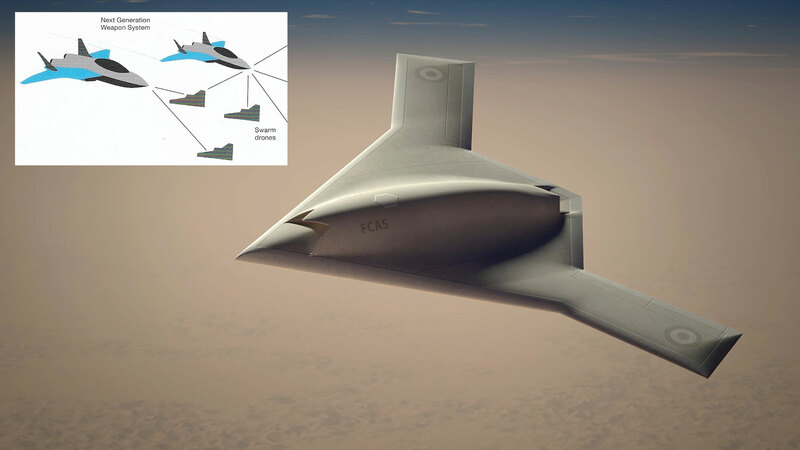 As described by Airbus Defence & Space, this would consist of a stealthy manned fighter flying with “swarm drones” to protect it and act as offboard sensors. The German and Spanish air forces need more than 100 fighters to replace their aging Tornado and F-18 fleets, Airbus D&S project manager Achim Pittner told employees in the company’s in-house newspaper. “This is an enormous opportunity for us. We need a partnership with governments and industry, which we intend to lead,” he added. Boardman of BAE Systems noted that his company was not necessarily reliant on future collaborative European fighter programs. He referred to a recent Anglo-Japanese announcement on potential collaboration, and to the rather more definitive agreement that BAE Systems reached last January to design and develop a next-generation fighter with Turkish Aerospace Industries (TAI). That deal is worth £119 million ($155 million) to the British company, it revealed in its half-yearly financial report published today. But the contract has not yet been signed. The Paris agreement last month also referred to the ongoing effort to create a “Eurodrone,” eg the European MALE RPAS (Medium Altitude Long Endurance Remotely Piloted Aircraft System). France, Germany, Italy and Spain awarded a two-year project definition contract to Airbus D&S, Dassault and Leonardo last September. France and Germany have now agreed that this RPAS should be twin-engined; the U.S. Reaper UAVs that France, Spain and the UK are operating are single-engined. The agreement predicted the signature of a development contract in 2019—one year later than specified when the study contract was awarded. At that time, the first flight of a prototype was foreseen in early 2023, with first deliveries two years later. France and Germany have also resolved to seek a “European solution” to their future maritime patrol aircraft requirements; to cooperate on the next version of the Tiger attack helicopter; and to develop a common program for tactical air-to-surface missiles.